Freon® is the trade name of a group of refrigerant gasses that have been in use since the late 1920s. Freon products have been used extensively in commercial applications, such as food storage, processing, and transportation. Most homeowners are familiar with Freon’s use in refrigerators, freezers, and air conditioning units. Freon gasses fall into the categories of chlorofluorocarbon (CFCs) and hydrochlorofluorocarbons (HCFs), which have been found to negatively affect the earth’s ozone layer. As a result, they have been in the process of being phased out since 1987 as part of the Montreal Protocol. That’s raised a number of questions for homeowners as they look to repair or replace household appliances, especially air conditioning units, that use Freon. Here’s what you need to know to decide how to handle your Freon-based AC. 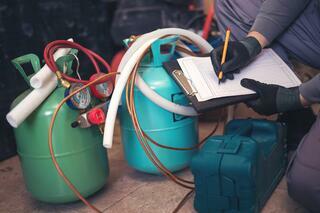 The handling and recycling of refrigerants is regulated by the United States Environmental Protection Agency (EPA). You can find details on those regulations on the EPA website. But the key information to know is that federal law mandates that only EPA certified technicians can handle Freon. That means that if your AC unit is leaking Freon, you need to call in an expert with the appropriate certification. While Freon is no longer used in new AC units, many homeowners have older units that still run using Freon. So what should you do if that unit needs repair? According to the EPA, you’re not required to stop using an air conditioner just because it contains Freon. So if you just need minor repairs or tune-ups, it’s safe to keep using your current unit. There are now many new refrigerants that are eco-friendly. Some of them are designed to replace Freon in existing systems, such as R422D. It’s referred to as a “drop-in” refrigerant because it’s a relatively easy process to remove the Freon and replace it with R422D — by a professional, that is. Depending on how long you want to keep your current system and its overall condition, this may be a good alternative to outright replacement. If your air conditioner is chronically leaking Freon or you’ve invested in a lot of repairs in the last few years, it may be time to simply replace your old unit with one of the many new, energy efficient models. At Stay Comfy, we recommend Carrier’s lines of air conditioners, which use the environmentally safe refrigerant Puron®. It’s important that you work with a certified HVAC pro, regardless of how and when you decide to repair or replace your AC unit. Not just because it’s that law, but because it protects you and your family. Find a qualified professional in your area using our dealer locator. Freon® is a registered trademark of The Chemours Company FC, LLC.